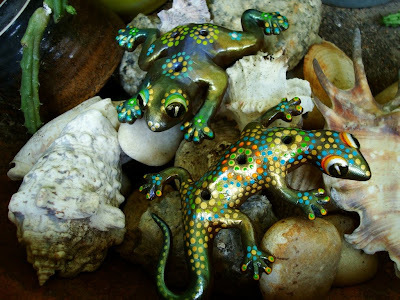 this is special request from a buyer in etsy ... she asked if i could make katak (frog) & cicak (gecko) for her as fridge magnets instead of incense holders. so here i am sculpting again ... this is katak ... i'm using studio by sculpey. very soft and easy clay to work with and has a suede-like finish after cure. apparently extremely durable as well and comes in the most mouth watering colors!! but i'm sticking to a dark and natural color here so that the pearl-ex powder comes out better. aww wow! they're going to look awesome! :o) hehe, you're right about them looking humanish.. strange..
And the frogs back and bum do look human! these are just beautiful, both the finished ones and the ones that are in progress. I would love to see a video of you sculpting! Have you got one? thank you!! oooo... i think we're in the same wavelength here ... big and blue? oh yea baby!! thank you my fren :)) oh man!! blue?? that's way cool!! thank you :)) hahaha!! oh yea ... i think it's the bum ... i should try and use the same technique and see if i can sculpt a human! i'm always nervous with human anatomy, whether it be painting or sculpting ... i can never get the proportions right!! These are wonderful- especially finished with the colors! I loved Avatar too, btw! These are great! Really interesting to see them in progress and I agree that you should definitely sculpt a person at some point - I bet you'd be amazing! Wow....your gecko's are so cute. And too funny about the hiney on your little gecko! It does look human. hehehe!